The Dial Typewriter from Louis Marx and Company is a classic example of the type of tin lithograph toy that helped the company become one of the largest toy manufacturers in the world by the 1950s and continue to endear them to collectors to this day. 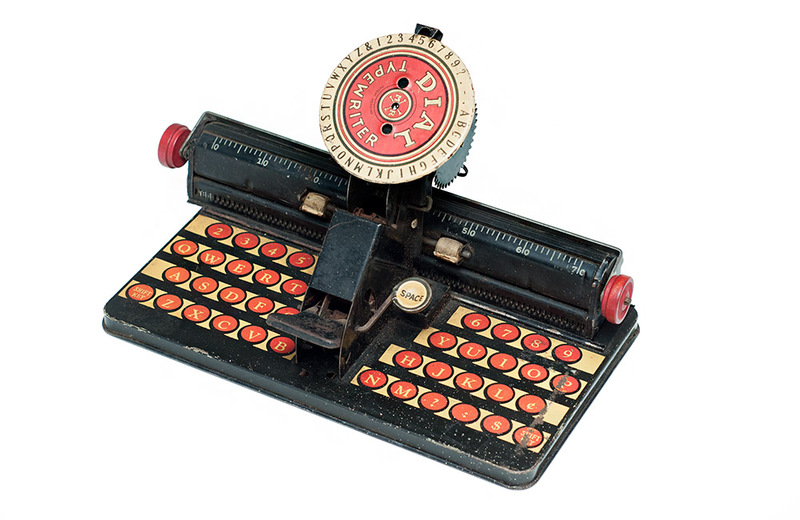 Like other tin toys produced during this time period, the typewriter was fabricated using thin sheets of steel covered (or plated) with a thin coat of tin. A process called chromolithography (a precursor to offset printing) was used to add a colorful design (in this case, a facsimile of typewriter keys) to the toy. Despite appearances to the contrary, the dial typewriter is fully functional. 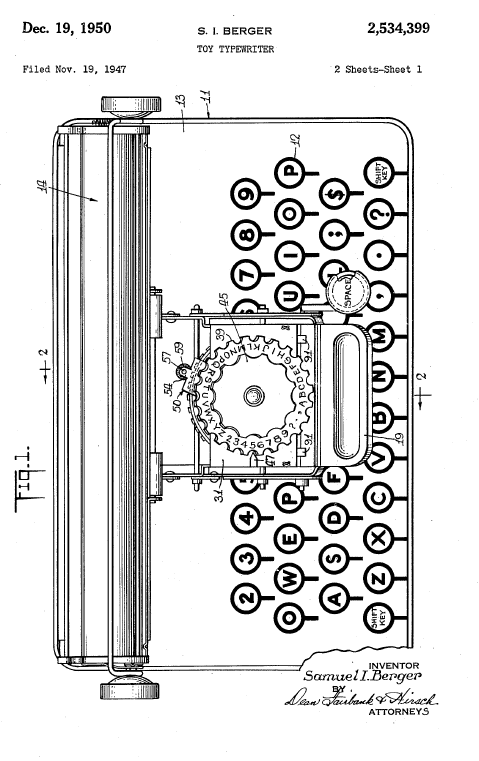 It operates by turning the large dial in the center to the desired letter and pressing down on the large black lever to lower the print head to the paper. The space key can also be used to advance the print head. Two rubber rollers work in concert with a red wooden dial on each side of the paper head to advance paper through the toy. 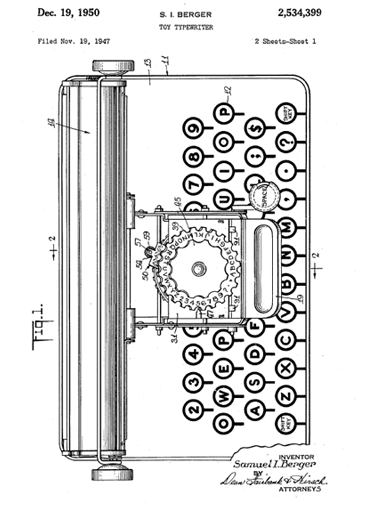 Regular alterations to existing models allowed Marx to sell a variety of different toy typewriters over a 40-year period. Many of the toys were designed on commission and patented by Samuel Berger. He resided in Newark, New Jersey; a stone’s throw from Marx’s headquarters in New York City. 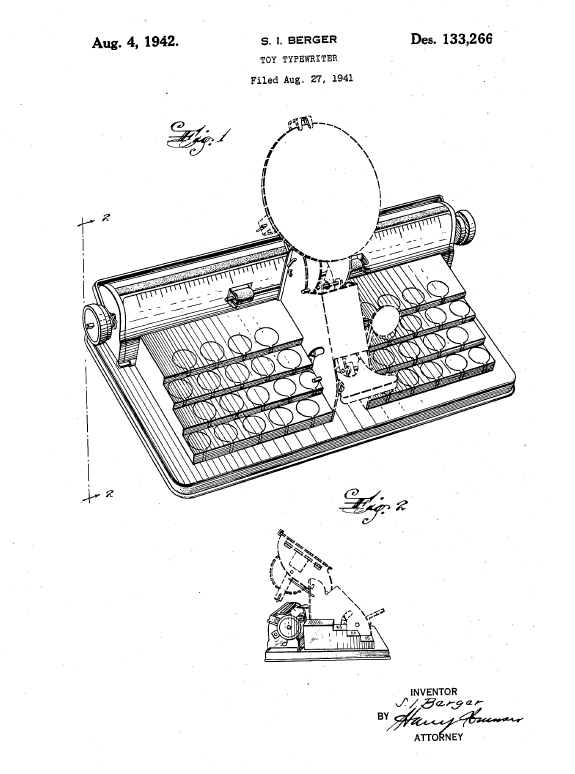 United States Patent #133,266, filed August 27, 1941 and United States Patent #2,534,399 filed Nov. 19, 1947 are two examples of the many toy typewriter-oriented patents attributed to Berger. As I delved into the history of this toy, I quickly realized that, without instructions, I had no idea how to properly load it with paper. 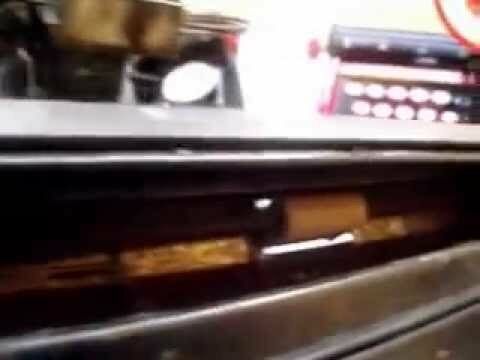 Much to my surprise, I was unable to find a suitable “how-to” video on YouTube. Turning to Google, I discovered oz.Typewriter, a blog “all about typewriters” written by Robert Messenger, a columnist at The Canberra Times in Australia. A few days later, he replied to my query, providing a link to a YouTube video he recorded outlining the steps! I’ve embedded it in this post, in order to help out anyone else who may find themselves in the same boat. And many thanks to Mr. Messenger! I’ve added oz.Typewriter to my blogroll and encourage you to do the same.